As cost of living continues to rise, more and more of us are considering keeping chickens for fresh eggs pretty much on demand. Providing you own plenty of outside space and you're committed to putting the effort into looking after your chickens, it can be an extremely rewarding way to spend your time. Chickens can provide plenty of entertainment as well as fresh produce. Kids in particular love the excitement of keeping chickens and it's a great way to teach them how to care for small animals. 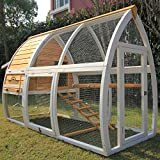 Investing in a high quality chicken coop is a must. After all, happy chickens produce extra tasty eggs! The main advantage of a solid coop is, of course, your chickens' safety. There will be attempts to break in so you need to make sure those chickens are well protected from unwanted attention. Plus your coop will stop your chickens from wandering off to pastures new. They also provide comfort for your brood, offering them room to rest and protection from wind and rain. Coops that feature plenty of 'outside' protected space as well as a safe haven are particularly chook-friendly. If you can afford it (and have space), buy the largest coop you can manage. Chickens really thrive given spacious accommodation. There's a vast range of sizes to choose from and the coop you choose will depend on how many chickens you are housing. 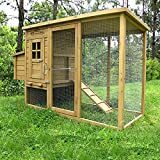 You will find that the vast majority of chicken coops are made from a wooden frame and wire mesh. However, plastic and metal versions are available and can stand up a little better against the weather. But if you buy a wooden coop, as long as you protect and treat the wood, they provide ample protection for your hens and roosters. A 'walk in' chicken coop is especially handy for collecting eggs, checking on your chooks and cleaning their coop out on a regular basis. They're built to accommodate humans as well as chickens so that you don't have to crawl in on all fours to gain access. Arks are usually built in a triangular design with a wooden frame covered by mesh. 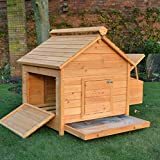 Some are completely open to the elements but others feature a cosy little house at one end so your chickens have a shelter should they need it. Arks tend to be better for smaller broods but they do come in various sizes for bigger teams. 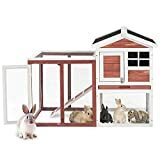 Houses provide tonnes of space for your brood to run about and usually feature covered, cosy areas, a chicken run and a generous nesting box. A chicken house is a great way to provide everything your chickens need in one place. They aren't cheep (sorry), but they're definitely worth the investment. Houses are the most versatile option for your hens so they can run, rest and nest comfortably in one place. They'll soon settle into their new abode and you'll love knowing they're safe and happy.